Use this page if you have a fixed dock. The Air-Dock floating boat lift must held in place with lines tied to four corner points. This section will help you determine what the four corner tie points could be based on your fixed dock configuration. In most applications, Air-Dock boat lifts can be installed without getting into the water. This is especially nice in the northern climates where boat lifts often need to be installed and removed each winter. No permanent connections to the dock are required. The Air-Dock is held in place with lines tied to the dock (or to pilings) at the four corners. If there is no dock or piling on one or more of the corners, the lines can be tied to anchors, auger poles, or to PVC frame kits (see below). Air-Dock boat lifts are so portable you can take them with you if you move your boat to another location. The Air-Dock boat lift is held in place with lines tied to four corner points. This section will help you determine what the four corner tie points could be based on your dock configuration. boat hull draft (not including props). water, such as salt water. For a fixed dock and a single slip, connect the lines to four corner points (usually the pilings that support the dock). To allow for water depth fluctuation, these lines may be connected with loops around the pilings or to vertical sliding devises. 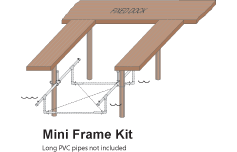 When using an Air-Dock boat lift with a fixed dock and a single slip with short fingers shorter than the boat, a Mini Frame Kit will provide the two stern corner points. 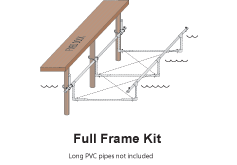 When using an Air-Dock boat lift with a fixed dock and a double slip, a Full Frame Kit will provide all four corner points. When using an Air-Dock boat lift with a fixed dock, a double slip with a finger (i.e. 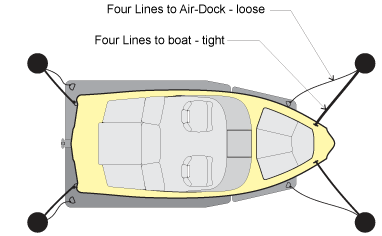 side dock) that is shorter than the distance to the transom of the boat, a Full Frame Kit will provide all four corner points. When using an Air-Dock boat lift with a fixed dock and a side tie application, a Full Frame Kit will provide all four corner points. 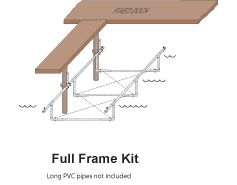 When using an Air-Dock boat lift with a fixed front dock application, a Full Frame Kit equipped with a "front mount kit" will provide the two stern tie points. The front tie points can be on the dock itself or the inside two corners of the frame. 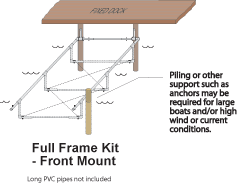 For large boats, or when using in heavy wind or current, the back of the frame may require extra support from anchors or poles.